As I heard the confirmation that the fans are pleased to see King K. Rool being new to the Smash Bros. line-up, it makes me want to do a custom sprite how King K Rool looks in Mugen style. Hi, should have carried away back from last month....so yeah, been there done that. I have drawn some of two new sprite displays, especially Marie's baseball victory and Dr. Mario. 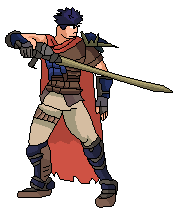 I will probably draw an Ike sprite until tomorrow...hopefully. While finished catching up on the whole episodes on MLAATR, I surprisingly forgot how great and creative it was! 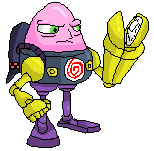 I had an brain grub what caught me to draw this sprite of Jenny/XJ-9 as a Mugenized fighter. Hmm, based on that Super Brawl mobile game huh? I wonder if you could also do a CatDog sprite based on their appearance from that game. I did make a CatDog sprite. One way, or another two ways! By the way, I have recently updated the image links for my other sprites I've made back.